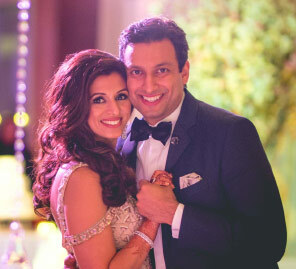 The stunning decor at Natasha and Bhavesh’s dreamy beach wedding was one of the highlights with magnificent blooms, lustrous crystal strands and picture-perfect stage setups. 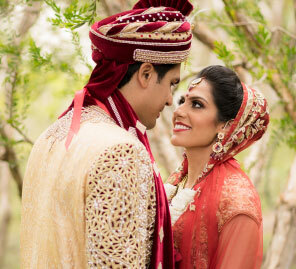 A fairytale told in florals – Natasha and Bhavesh's wedding was an elegant, opulent, glamorous day of love and laughter. Here, the couple shares how they planned their charming wedding celebrations in California. “The first night was the Mehndi celebration, which took place at Natasha’s residence in Los Angeles. We introduced each other to our closest friends and family. The exterior of the house was decorated with unique lighting sequences and inside, there was a colorful marigold theme and candles afloat in the pool. The night was filled with traditional ceremonies and late night dancing and mingling. “This was a particularly special day as it was also Natasha’s birthday. The lighting was colorful and romantic. The hall was decorated with upscale centerpieces and lounge sets bordering the dance floor. Guests were welcomed by the strains of the sitar played live by a musician with a gift for Indo-American fusion music. We entered the sangeet separately. I entered as a male vocalist sang an upbeat number to get the crowd excited. Then Natasha made her entrance to a female vocalist singing a slow, romantic, moving track. We intended for the dramatic entrances to evoke the feeling of a royal entrance on a red carpet. 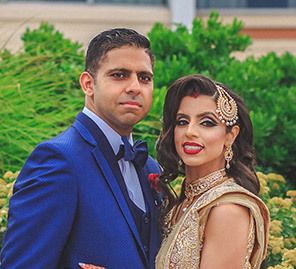 “For the wedding reception, Natasha wore a stunning red Vera Wang gown and I wore a three-piece Armani tuxedo with maroon bowtie and kerchief to complement Natasha’s outfit. After 3 days of traditional Indian ceremonies and clothing, we decided to have a more American-theme for the reception. We created a contemporary regal fantasy. Inspired by palace architecture and majestic furnishings, the decorations were carefully chosen to create an opulent atmosphere. The room was accented with rose gold and mirrored tables, white leather chairs with rose gold trim, beautiful rose gold accent pieces, and massive crystal centerpieces suspended from the ceilings. It was incredible to look at. We brought modernity to the classic palatial with a large LED screen with our logo in the center of the backdrop. Keeping true to our love for beaches, the table theme was the California beaches that Natasha and I love.